One of the best rock and roll Christmas songs ever, maybe the only one you can do air guitar to. 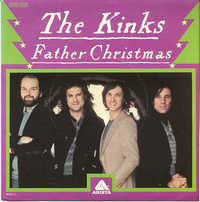 Recorded at the same time as their impressive Misfits album, the Kinks released this riff-laden ode to the real meaning of the holiday in December 2007. While 99% of Christmas songs performed by pop artists are slicked-up versions of old standards, the Kinks dared to be original and true to who they were -- satirists and observers who can rock at the same time. Christmas is not my holiday, although when this came out, people weren't as inundated with holiday music as they are now. "Father Christmas" appeared during the Kinks' big second wind of success, when they were on a roll with Arista Records, with albums like Sleepwalker, Misfits, Give The People What They Want, and Low Budget. They were helped along by New Wave's rock resurgence, band songwriter Ray Davies at the top of his game, and some hits like "Come Dancing." The narrator remembers the good old days when his dad dressed as Santa Claus, so when he gets older and it's his turn to do St. Nick in front of a department store, he gets mugged by a gang of kids. We only want the real McCoy. No mush on this song, but walls of electric guitars, a jingle bell-like piano, a snapping drummer, and brother Dave Davies whipping out searing solos. Below, the Kinks shot this video in their Konk Studio for the great British music series "Old Grey Whistle Test." The audio and video are not that great, but it's a treat to watch.